Enjoy a fun and educational guided walk to the 763-foot summit of the most famous crater on earth! Who was Diamond Head Charlie? Why did Kamehameha's warriors attack Oahu? Where were the ancient heiaus, human sacrificial altars and burial caves? How did the crater receive its famous name? Enjoy an educational and fun guided hike to the 763 foot summit of the most famous crater on Earth. Incredible 360 degree views of Waikiki and the turquoise blue Pacific Ocean await you. This exciting tour of the world famous Diamond Head Crater begins with a short introductory talk by a trained nature guide. You will learn about the fascinating volcanic creation, Hawaiian history, European discovery, early cattle ranching, and modern day military use of the “Gibraltar of the Pacific” while being escorted on a 45 minute walk that ascends to the 763' summit. Along the way our groups stop at several points to rest and photograph the crater. Walking up stairways, going into a dark 200 foot tunnel and climbing a spiral staircase imparts a sense of adventure. From the summit you'll be thrilled by the incredible 360 degrees panoramic views of Waikiki Beach, the emerald green mountains and the sparkling aquamarine water of the Pacific ocean below. The excursion lasts approximately 3 hours and is a truly memorable experience. You will also learn important facts about Hawaii’s native bird and plant species and will be presented with a Certificate of Achievement that states that you successfully made it to the famous summit of Diamond Head Crater. 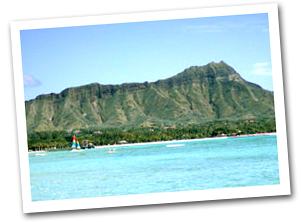 Diamond Head, one of the best-known volcanic craters in the world, is the iconic backdrop to Waikiki. The view from the summit of this 760-foot, extinct crater is well worth the climb. The steep trail to the top is mostly paved and defined by two sets of stairs - one, 99 steps, the other, 76 steps. It leads through a 225-foot tunnel and ends with a spectacular view of the island. Incredible 360 degree views of Waikiki and the turquoise blue Pacific Ocean await you. Try it at sunrise. Known in Hawaiian as Le'ahi (brow of the ahi-yellowfin tuna). The current name came was given to the crater by British sailors in the 1800's. When they first saw the crater at a great distance, the calcite crystals in the lava rock appeared to glimmer in the sunlight. The sailors mistakenly thought there must be diamonds in the soil. The volcanic crater, a major Oahu landmark, has been extinct for 150,000 years. The crater is 3,520 feet in diameter with a 760-foot summit. When the United States annexed Hawaii in 1898, harbor defense became a main responsibility. One of the major defense forts, Fort Ruger, occupied the Diamond Head Crater. A battery of canons was located within the crater providing complete concealment and protection from invading enemies. An observation deck was constructed at the summit in 1910 to provide target sighting and a four level underground complex was built within the walls of the crater as a command post. A 580-foot tunnel was dug through the crater wall to provide easier access to the Fort. It became a National Natural Landmark in 1968. It only takes a short drive or bus ride to get to Diamond Head Crater from Waikiki. This moderately challenging trail includes two sets of stairs, totaling 175 steps, as well as dark, underground tunnels and old military bunkers that require a flashlight. In the winter, Diamond Head's summit is an excellant spot to see humpback whales. The best way to catch sight of whales cruising around the ocean is to scan the horizon, looking for a blow. Once you've seen a blow, watch for the animal to breach. This tour does involve some physical activity such as walking over uneven / unpaved surfaces, climbing stairs or mildly steep terrain. Guests should be capable of walking 0.7 miles mild uphill and climbing stairs.This tour is not recommended for guests with walking difficulties or for children under the age of five years old. Pick-up Location: We can pick you up at any Waikiki hotel. If you are staying outside of Waikiki, (Ihilani, Ko'olina or the Turtle Bay Resort, etc.) and coming to town by rental car we recommend that you meet the tour group at the Ala Moana hotel (410 Atkinson Drive) where there is ample parking for you across from the hotel in the shopping center's parking lot. Included: Admission fee(s), Roundtrip transportation to and from any Waikiki hotel, Bottled spring water. A personalized "I Climbed Diamond Head" certificate with a photo of the crater, suitable for framing. 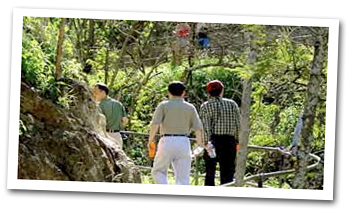 Rain gear, use of backpacks and walking staffs are also provided for all guests. What to Bring and Wear: We recommend wearing comfortable clothing and covered-toed walking shoes (tennis shoes or hiking boots are best). (* Please note that for your safety and comfort, sandals, slippers, flip-flops, high heels and platforms are not allowed on this hike!). Sun block or sun screen is recommended. The main focus is conservation through education, while having fun at the same time. Your guides are professional, trained and knowledgeable will accompany you on the entire trail, explaining its geologicalformation, historical facts, legends and show you its unique species, and provide a safe and memorable experience.